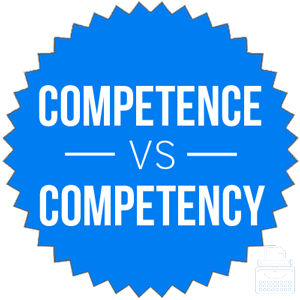 Home » Competence vs. Competency – What’s the Difference? Someone who has the skills to do something well is considered competent. Two nouns are related to this word: competence and competency. You aren’t alone if you are hard pressed to find a meaningful semantic difference between the two. Continue reading to learn more about these confusing words. What is the Difference Between Competence and Competency? In this post, I will compare competency vs. competence. I will use each of these words in some example sentences that show them in their proper contexts. Then, I will use a mnemonic device that makes choosing either competency or competence much easier for your own writing. What does competence mean? Competence is a noun. It refers to the ability to do something, usually at a basic or acceptable level. One who develops competence in a trade can work in that trade at a level basically equivalent to most peers. It took Eveline several years to develop competence in welding to the point where her foreman allowed her to do the task unsupervised. After details of the sordid affair came to light, many questioned the Prime Minister’s competence in comporting himself with dignity. The related adjective is competent, like in the phrase he was competent, but not outstanding. Like so many English words, competent can be traced back through Middle English to origins in Latin, where it was related to a verb equivalent to the English compete. What does competency mean? Competency is an alternative version of competence. Many sources consider it to be a needless variant, since it means the same thing: a basic ability to do something. Competency often appears in professional jargon, where annual performance reviews and professional development checklists refer to concepts like professional competency. In this sense, competency refers to an area in which one has been professionally trained. The term also has a legal sense, competency to appear in court, which means that a person is able to function at a basic level in a courtroom. A person who has a severe mental disability, for instance, might be impaired to the extent that she would be considered legally incompetent. The National Association of School Psychologists identifies ten competencies that trainees must possess in order to practice in the field. A psychiatrist examined Eleanor and determined that she possessed competency to appear in court. In most situations, you should stick with competence as a noun meaning a basic ability to do something. Competency is a variant that has found a home in some professional and legal contexts, but as a word, it is largely unnecessary. Competence vs. Competency Check: Since competency and silly both contain the letter Y, remember that competency is a silly word so that you will always know to use competence unless you have a good reason to do otherwise. Is it competence or competency? Competence and competency are variants of a noun that means a basic ability to perform a task. Competence is the better choice. Competency is used in some professional and legal contexts. 1 What is the Difference Between Competence and Competency?